I've been watching a DVD of the first season of The Bob Newhart Show. In one of the episodes "The Crash of 29 Years," Bob's receptionist, Carol Kester (later Carol Kester Bondurant), leaves her job because she feels unfulfilled. At the age of 29, Carol finds herself in a rut, fearing that she will never achieve more in her life than being a receptionist. After viewing the episode, I became curious about Marcia Wallace, the actor who portrayed Carol, and decided to do some research about her. I soon discovered that she is a very funny lady who has overcome a great deal of adversity in her life. Marcia Karen Wallace was born in Creston, Iowa on November 1, 1942, the eldest of the three children of Arthur "Poke" Wallace and his wife Joann. Poke owned and operated a general store in Creston where Marcia and her sister Sharon and brother Jim would frequently assist their father. Marcia's childhood was a difficult one in which she had to deal with her dad's alcoholism (Poke Wallace went on drinking binges) and physical abuse. In an article in in the 2006 Summer issue of Diane: The Curves Magazine, her father is described as not quite being able to control his temper. Wallace herself is quoted as saying that she had "fractious relationships" with both of her parents and that her mother "really didn't like me all that much." Weight problems have plagued Marcia all her life and she has been bulimic. The carrot-topped comedienne has stated that "food is her drug of choice." She told The Curves Magazine that during her youth, she felt "more than lonely" and thought she was the "ugliest, fattest kid around." Due to her low self-esteem, she developed a self-deprecating form of humour. She made faces and learned to poke fun at herself before others did. Marcia attended Parsons College in Fairfield, Iowa, majoring in English and Theatre. At Parsons, she performed in productions such as Brigadoon and The Music Man. Soon after graduation, the aspiring actor headed for New York. While in the Big Apple, Marcia took various jobs to make to earn a living. She did commercials, typed scripts, performed in summer stock and was a substitute English teacher in the Bronx. She began her stage career with the improv troupe The Fourth Wall and in off-Broadway plays during the late 1960s. Due to her imrov work, Wallace eventually became a semi-regular on The Merv Griffin Show, appearing on Griffin's New York talk show numerous times. In 1970, when the show moved to the west coast, Merv asked her to relocated to Hollywood with him. Once in Tinseltown, she won minor roles in two very popular sitcoms. She appeared as Betty on a 1971 episode of Bewitched (Season 7, Episode 27, Air Date: April 15, 1971) entitled "Laugh, Clown, Laugh" and in two 1971 episodes of The Brady Bunch, "Will the Real Jan Brady Stand Up?" (in which she played a saleswoman) and "Getting Davy Jones." (in which she played Mrs. Robbins). That same year, she also appeared in two cameo roles on the detective series Columbo in episodes entitled "Lady in Waiting" and "Murder by the Book." Marcia finally got her big break, however, as a result of her association with The Merv Griffin Show. Her appearance on a March 1972 Griffin show greatly impressed CBS founder William Paley. At Paley's request, television producer Grant Tinker phoned her and offered her a supporting role on Bob Newhart's new sitcom as Bob's chatty receptionist, Carol Kester. The Bob Newhart Show debuted in 1972 and became a hit with audiences. Set in Chicago, the series featured Newhart as psychologist Dr. Bob Hartley and the late Suzanne Pleshette as his school teacher wife, Emily. Dr. Hartley shared his office suite with an orthodontist, Dr. Jerry Robinson, played by Peter Bonerz. The Hartleys also had a friendly next-door-neighbour, airline navigator Howard Borden, who was portrayed by Bill Daily. 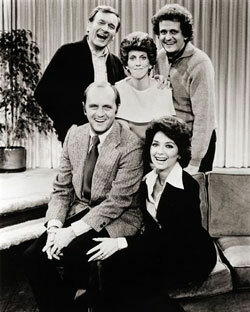 Below is a photo of the Bob Newhart show cast: (Back row (left to right - Bill Daily, Marcia Wallace and Peter Bonerz. Bottom Row - Bob Newhart and Suzanne Pleshette). Viewers identified with Marcia's character, the red-haired, lovelorn receptionist with the toothy smile. Carol Kester wasn't your stereotypical TV secretary. In her Curves Magazine interview with Diane Heavin, Marcia describes her television character in this way: "She was different from from most secretaries in sitcoms. She wasn't in love with her boss, for one. She wasn't ditzy. She wasn't super prim or a spinster. And she wasn't a buxom beauty, yet she had lots of romances, which I thought was wonderful. She was a nice person, a hard worker, and an optimist, and she was really good at her job. She also had a great sense of humour." In a 1975 episode, "Carol's Wedding," (Season 4, Episode 6, Air Date: October 18, 1975), Carol announces her engagement to travel agent Larry Bondurant, played by Will MacKenzie (After being set up by Emily, the couple went on a blind date and Larry proposed that same night). The office is buzzing with speculation about whether Carol will actually go through with the marriage to Larry whom she has only known for 12 hours. By the way, Larry's nickname for nickname for Carol was "Big Red." The Bob Newhart Show ended its run in 1978 after six seasons. 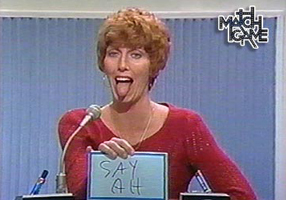 For the next thirty years, Marcia made numerous appearances as a game show panelist on such shows as Hollywood Squares, Match Game, To Tell the Truth, The $25,000 Pyramid and Family Feud. She became good friends with fellow Match Game panelist Brett Somers. Somers, who was married to Jack Klugman, died of colon and stomach cancer in 2007. During the 1980s and 1990s, Marcia appeared as a guest star on such series as Magnum P.I. (1981), Murder, She Wrote (1986), Alf (1987), Night Court (1988), Charles in Charge (two episodes as Mrs. Dodo in 1989, 1990) and Full House (four episodes as Mrs. Carruthers (1993-1995). Since 1990, she has had a recurring role as the voice of Edna Krabappel on the popular animated series The Simpsons. Edna is Bart Simpson's Grade 4 teacher at Springfield Elementary School. Like many of the teachers at the school, Edna is a heavy smoker. Her catchphrase is "Ha!" and she once told Bart that she "never thought she would say this to a child but you are bad on the inside." In 1992, Wallace received an Emmy for Outstanding Voice-Over Performance for her work as Edna Krabappel. .
From February 11, 2009 until April 30, 2009, Marcia appeared in 14 episodes of the daytime serial The Young and the Restless. She portrayed a character named Annie Wilkes, a bumbling kidnapper who threatened wealthy industrialist Katherine Chancellor (Jeanne Cooper). 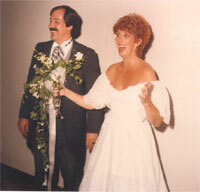 On May 18, 1986, when Marcia was 43 years old, she wed hotelier Dennis Hawley at the Buddhist Temple in Cucamonga, California. The two had been introduced to each other by Jo Anne Worley, who was performing in a musical with Marcia at the time. Dennis was the general manager of the hotel next door and Worley set them up. In 1985, just three days after Hawley's marriage proposal, Marcia was diagnosed with breast cancer. She underwent a lumpectomy and radiation treatment. The cancer never returned and Marcia became a passionate advocate for breast cancer awareness and early detection. She gives inspirational lectures on the subject and in 2007 she received the Gilda Radner Courage Award (named after the late comedienne who died of ovarian cancer) from the Roswell Park Cancer Institute for her work in educating Americans about the disease. Wallace and her husband adopted a son, Michael "Mikey" Hawley in 1988 and they chose Brett Somers to be their child's godmother. Sadly, Dennis succumbed to pancreatic cancer in June, 1992, leaving Marcia to raise the young boy on her own. Of her son, Marcia has said that he's funny and a great mimic. He apparently does an imitation of his mother. 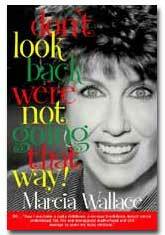 In 2004, Marcia published a memoir, Don't Look Back, We're Not Going That Way. In her autobiography, she chronicles her battle with breast cancer, the death of her husband and her nervous breakdown. The book's title is a quote from her father, who gave her that advice often during childhood. 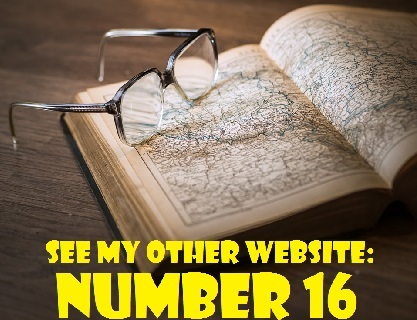 Its subtitle is "How I Overcame a Rocky Childhood, a Nervous Breakdown, Breast Cancer, Widowhood, Fat, Fire & Menopausal Motherhood and Still Managed to Count My Lucky Chickens." To watch a 2010 interview with Marcia Wallace, click on the link below. The interviewer is Nancy Brewer, Editor of The Lamp, Delta Zeta Sorority's national magazine (Marcia is a member of Delta Zeta Sorority and was honoured as the 2010 Delta Zeta 2010 Woman of the Year at the Biennial National Convention in Tucson, Arizona. 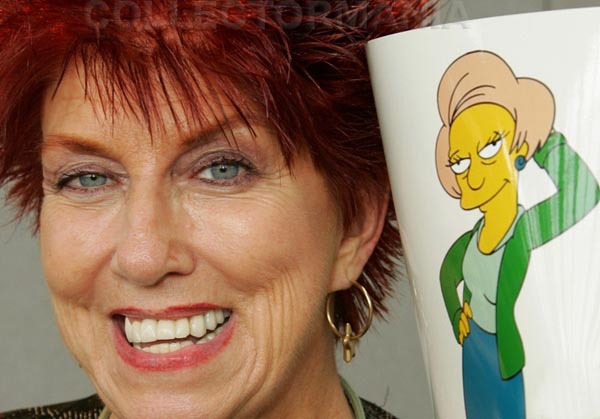 EDITOR'S UPDATE (October 27, 2013): Marcia Wallace has died at the age of 70, Simpsons executive producer Al Jean announced yesterday. Jean stated, "I was tremendously saddened to learn this morning of the passing of the brilliant and gracious Marcia Wallace. She was beloved by all at The Simpsons. It's "a terrible loss for all who had the pleasure of knowing her." Jean said that Marcia's character, teacher Edna Krabappel, would not be replaced. 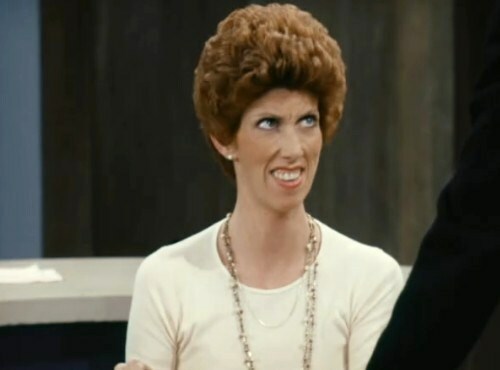 According to TMZ, Marcia Wallace passed away on October 25, 2013 in Los Angeles. Her son Mikey stated that his mother died due to pneumonia complications.